Have you just had a new kitchen put in? Or maybe a bedroom renovation? Or have you just done a lot of work in the garden and now you’re left with piles of garden waste? 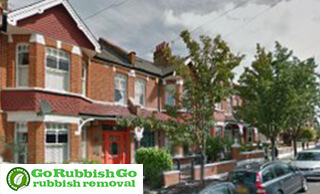 It sounds like you could do with a rubbish removal in East Sheen, SW14. Is that right? If so, hire us today and we’ll get all that rubbish moved in no time. You can rely on us 100% for great quality services anytime you need them. So do get in touch if you could do with a professional helping hand and let us help you as much as we can. We can dispose of old mattresses, old fridges, old washing machines, garden waste and whatever else you’ve accumulated that needs dumping. However, we don’t just dump it. We recycle it. 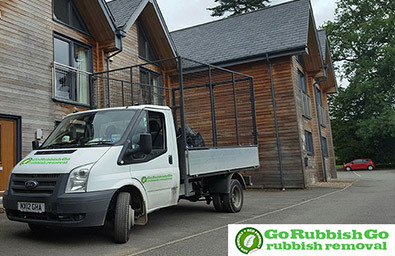 Our rubbish disposal services are eco-friendly and we make sure nothing gets wasted. So call 020 8610 9182 today for the best SW14 waste clearance services in the area! Treat yourself to expert help! Have you been searching high and low to find a rubbish removal company that offers high quality waste disposal in SW14 but doesn’t cost an arm and a leg? It is tough finding that kind of company because usually if you want cheap services, you don’t get quality services and if you want quality services, you have to pay a lot more. With Go Rubbish Go, that is not the case. We provide amazing services all at affordable prices. We don’t believe in charging over the odds. We want to offer bargains to all our clients. Book now and see for yourself! 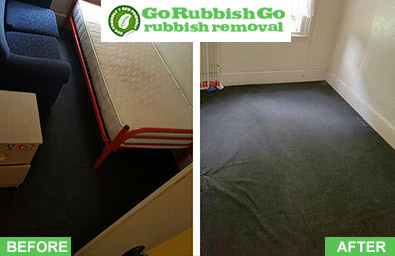 What's so Amazing About Our East Sheen Rubbish Removal Service? Having rubbish piled around the house can be dangerous. It’s easy to trip up over it and this could lead to a sprained ankle or even something worse. Avoid this at all costs – hire us now for your rubbish clearance in SW14, East Sheen. You can trust us to do a great job and we certainly won’t let you down. A home renovation or office renovation can be stressful enough as it is without having to sort out getting rid of all the rubbish. Let us do it for you instead and you can say goodbye to stress. The reason our rubbish removal service in the SW14 area is so incredible is because it saves you time and energy, and we treat our clients with care. We respect your needs and whether you are an old or new customer, we will still treat you like royalty because your needs matter to us. 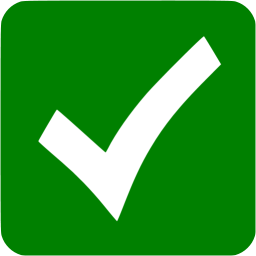 Booked their waste collection service in East Sheen, SW14 at really short notice. They reacted immediately and sent out a team to collect my old fridge and oven. I was assured they’d send the items for proper recycling, which was important to me. Very prompt and reliable service! We know that all people are different and thus have different needs. That is true for rubbish removal needs too. That is why we strive to tailor our packages to suit your East Sheen waste collection needs. That way, you not only get exactly what you need, but you also save money otherwise spent on unnecessary services included in inflexible packages. If you want help with rubbish disposal in SW14, get in touch with Go Rubbish Go now on 020 8610 9182 and you can speak to one of our friendly and helpful advisors. You will get a free estimate too! We will also give you a money back guarantee. We can offer you the best waste removal East Sheen, SW14 service. So if you know what is good for you, hire us today and we can come over to clear away your rubbish at any time of day. 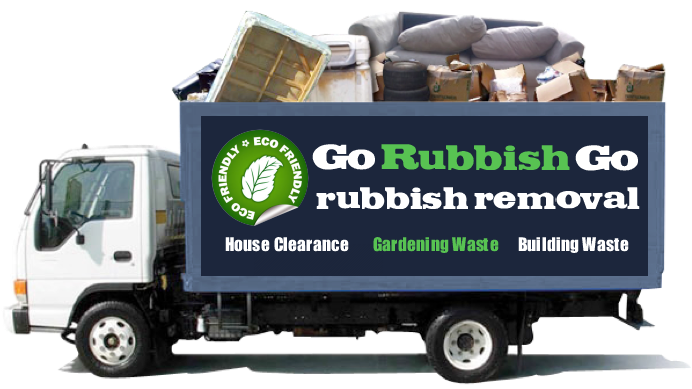 We are available 24/7 so you can call anytime you need help with rubbish removal. Our service is the best for miles around so you won’t regret contacting us! Are you looking forward to a rubbish free, spacious home or office? Book with our team now! Call 020 8610 9182 today if you would like more details and don’t forget you’ll also get a free quote! East Sheen is a London suburb in the Borough of Richmond upon Thames and is often referred to as just Sheen. It is a busy area with plenty of shops, offices, businesses, cafes and restaurants and serves as a commercial hub for the Mortlake district. In fact, East Sheen was a manor of the Mortlake parish in the past and there was a country estate here, at Temple Grove. Today, the high street is where most commercial outlets and entertainment options are concentrated. A milestone from 1751 that marks the 10-mile distance from Cornhill and a war memorial can be found in The Triangle and St Mary the Virgin Parish Church is another local landmark. There’s also a WWII air-raid shelter in St Leonard’s Road, which is Grade II listed.